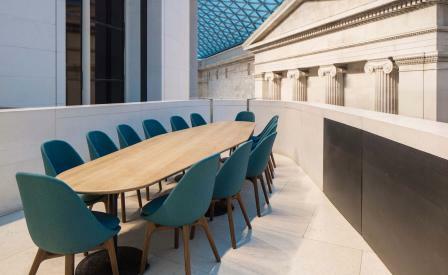 Since its redesign by Foster + Partners, the British Museum’s Great Court has suffered the curse of the London icon: an incomparable venue without a café to match its splendour. Now the floodlit hall has found its foil. Designed by Softroom, a London-based practice with a skill for unearthing jewel-like corners from immense public spaces, the café occupies the terrace behind the majestic Victorian reading room. The design incorporates casual bistro seating and communal dining. The most brilliant touches, however, are the long banquettes that jut out into the rotunda, its upholstery absorbing the din from the vaulted-glass space. The teal and teak colour scheme manages to be fresh and contemporary while also referencing the gem-toned tables and books in the reading room.